It was a very successful 2016 Berlinale for the young German director Anne Zohra Berrached: programmed in the Competition, her second feature film 24 WEEKS (zero one film, Filmakademie Baden-Württtemberg), which focuses on the polarising subject of a late abortion, moved the audience on its world premiere in the Berlinale Palast. The film team led by the filmmaker and the lead actors Julia Jentsch and Bjarne Mädel were rewarded with long, enthusiastic applause and even standing ovations. Apart from much praise and attention, 24 WEEKS also garnered the Prize of the Guild of German Arthouse Cinemas. The sales agent Beta Cinema confirmed deals for Germany (Neue Visionen), Benelux (September Films), Poland (Aurora Films), Greece (Feelgood Entertainment), Turkey (Filmarti), Ex-Yugoslavia (Discovery Films), Hungary (Cirko), Columbia (Cineplex), Taiwan (Swallow Wings), China (Lemon Tree Entertainment) and Korea (JinJin Pictures). Negotiations are near to being closed for Scandinavia, Eastern Europe and France. Jella Haase was selected as one of the best young European acting talents in the EUROPEAN SHOOTING STARS program of European Film Promotion (EFP) and received her award in the Berlinale Palast from the former SHOOTING STAR Daniel Brühl. There was enormous press interest in the young actress even before the Berlinale started as well as during the festival. She was also much in demand from the international casting directors, agents, and directors. A German director in the feature film competition, a number of prizes, a sale to the USA during the festival, good reviews in important media – cinema from Germany gave people plenty of positive things to talk about at the 32nd Sundance Film Festival (21 – 31 January 2016), the most important North American festival in the independent field. Following Bastian Günther's HOUSTON in 2013 and David F. Wnendt's WETLANDS in 2014, 2016 again saw a film by a director from Germany screening in Sundance's international feature film competition. WILD by Nicolette Krebitz (Heimatfilm) celebrated its world premiere in the World Cinema Dramatic Competition. 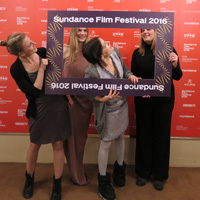 The director and the lead actress Lilith Stangenberg were there in person at the sold-out performance to present the story of a young woman who invents her life anew after an encounter with a wolf. There was a lot of discussion about the film during the festival, and much praise, in particular, for Lilith Stangenberg's performance, including fromTodd McCarthy in his review for The Hollywood Reporter. The New York Times film critic Manohla Dargis described WILD as "a terrifically original German fiction film", while Screen International suggested that the film has "cult potential". First German Netflix series DARK will be directed by Baran bo Odar (WHO AM I - NO SYSTEM IS SAFE) and produced by THE LIVES OF OTHERS-producers Wiedemann & Berg. 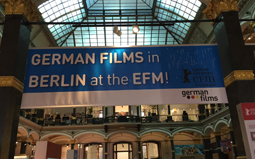 More..
German films in Miami, Guadalajara, Dublin, Santa Barbara and at New Directors/New Films New York. 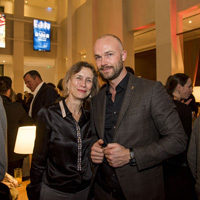 Awards for German films in Angers and Rotterdam.